Here is an antique figural trim featuring a bobbin lace stag deer and a Fleur De Lis flower pattern with Point de Paris six point star mesh. Antique Stag Deer Bobbin Lace Trim Measurement: 1 yard and 30" long (yardage) x 2 1/2"
Machine done early bobbin lace trim. Circa: early 1900's. Used Antique Lace Trim: This antique figural bobbin stag deer lace trim is from a used silk bed sheet. 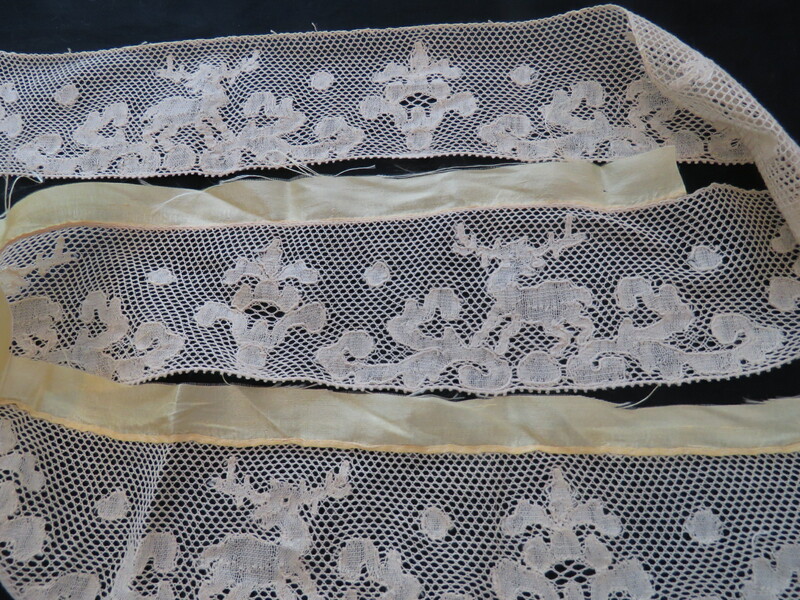 A narrow strip of the silk bedsheet will be remaining attached to the antique Point de Paris lace trim. Antique Point de Paris Deer Reindeer Lace Trim Condition: Overall the antique Point de Paris lace trim is in very good condition. I saw a few breaks within the overall antique lace trim. The antique bobbin lace trim design is a repeating pattern of a stag deer and a Fleur De Lis through the lace. The bottom edge of the antique lace trim has a tiny picot edging. Color: beige light ecru (see photos).